A surprising new study reveals how goats are similar to man's best friend: dogs. 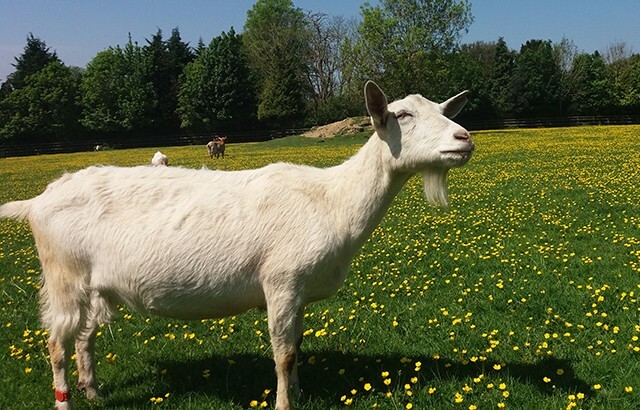 Scientists suggest that goats can apparently become domesticated like dogs. Researchers from the Queen Mary University Of London carried out this study where it involves experiments for goats to take off the lid of a box and then receive a reward for completing this task. When researchers made the tasks more difficult or nearly impossible to carry out, goats approached this problem by gazing to nearby humans, the same way dogs stare at humans when they are in trouble. This new finding would also suggest that our idea of co-evolution with domesticated animals can be changed. According to Jenna Kiddie from the Anglia Ruskin University, dogs learned to follow the human gaze for hunting, however, there was never a human social need for goats apart from being a food source for meat and milk, which can teach new insights about animal domestication. Past studies on dogs and wolves have shown how one species is domesticated than the other, however, barnyard species can yield surprises. Kiddie adds, animal cognition can be seen especially in crows, which are considered as very intelligent creatures. However, the social aspects of these animals with humans are still being explored. She adds how sheep can show less "human" traits than goats as they are neophobic or being afraid of everything and cluster together in herds, never making eye contact. However, goats have the natural desire to explore beyond their own species, and were also the first species that humans began to domesticate, some 10,000 years ago. Kiddie concludes that all animals should be given some type of respect, however, there will be implications on handlers and their interactions with their goats, since now we know what goats like and do not like. This new study is published in the journal Biology Letters.